The wonderful indoor parks that make Ireland a top winter holiday destination for all UK skateboarders are going to be subjected to the savages aboard the good ship Shiner. 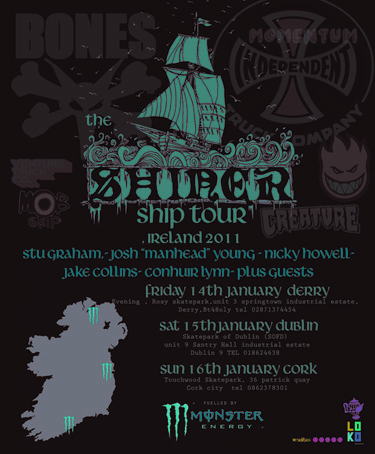 Nicky Howells, Jake Collins, Stu Graham and Josh “Manhead” Young will be joining Conhuir Lynn in Ireland in January for a Monster tour. See the flyer below for all the dates and deets and get involved!